Family time! Last minute flights are my jam. Trip centered round relaxing and food and family, and well lots of food. As I said in my September & October post, I literally finished my job at Pike Place Market on August 31st, then flew to the east coast on September 1st on a nice 8 am flight. Highly recommend not doing those, especially when you avoided packing and have to do some late night grab and suitcase stuff. It’s been about four years since we went back to the east to enjoy beach time and an iconic fourth of July. It is SUCH a haul. Depending on where you’re flying from on the west, it can easily be a four hour flight, not to mention an arduous time change. BAM! You’ve got a full day of travel. Another quirk of the east is the beauty of proximity; you can drive for a few hours and drive through three states in the blink of an eye. With numerous major cities, you have options. These options allow multiple, reasonably close airports to fly into to save money. Hi Dulles International Airport and two hour drive to Pennsylvania!!!! I arrived in D.C. around the same time my family landed. For once, the flights were on time and our coordination was impeccable. The whole fam was reunited! The four of us weaved our way through the Dulles crowd, an oddly incompetent group of travelers that day, to get the shuttle for the rental cars. That sweet east coast humidity hit us like a ton of bricks and we prayed for the shuttle bus to arrive. A quick drive and 30 minute wait for our car came and went and we drove off into the afternoon thunderstorm. Looking out the window on the drive, I noted the rolling hills and the corn fields for miles. The people are nicer and everything seems much simpler in the Pennsylvania countryside. The drive to Pennsylvania wasn’t all bad, and we made it to Nana and Pop Pop’s that evening. The relaxation commenced! We slowed down and just spent quality time together. I got a significant amount of reading down - blazing through Crazy Rich Asians - and spending the evenings out on the back patio. Nana always had the best food for each meal. When I was younger, I hated red sauce, even though I love tomatoes, but I would always eat hers. So, of course, she had to make her famous sauce. It was nice to do all of our favorite things too. This includes a trip to our favorite grocery store, Wegmans. Wegmans is the holy land of supermarkets. It’s upscale and has everything you could ever want or need. I counted four different bread aisles when we were wandering. FOUR! We also couldn’t pass up the opportunity to grab a bag of Gibbles chips and snagged a bag for the car. One of the best and coolest parts about going back to your grandparents’ house is rifling through the basement. You’ll find the coolest antiques and memorabilia. Old patches, cash register, pictures, and wedding gifts from my parents’ wedding all hold stories. On Labor Day, we drove into Harrisburg, the state capital to explore because Gina and I had never really been before. Plus, there were a festival we were going to walk around. Harrisburg is super cute and colonial. There’s lots of brick buildings and decorated stoops to the front door. But, wow, as we admired the architecture, we became sluggish with each step. It was in the upper 90’s with 80% humidity and feeling every bit of it. No one was safe from the heat and we all were sweating bullets. We made one pass through the Labor Day festival along the Susquehanna River, and beelined it back to the car, opting to drive the rest of the city and admire Harrisburg from the comforts of an air conditioned car. The next day, Nana tagged along with us on our adventure for the day, heading out to downtown Lancaster. First stop of the day was at Passenger Coffee, a specialty coffee shop that makes a mean latte! It definitely caught my eye from the street with the airy white walls and wrap around cafe seating. The real reason we came to town was to check out the Lancaster Central Market, one of the oldest markets in the world boasting operation since 1730. Vendors have day stalls with the freshest meats, produce, and goods from Lancaster County. Though Pike Place Market has my heart, you cannot rival some of the produce on the east coast; it’s the soil and the Amish. Don’t argue with me on this. The Lebanon bologna is out of this world. The corn, unparalleled. The cherry on top is that it’s all housed in a refurbished red brick building, score! If you’re ever in the area, this place is a must stop! The heat was starting to get the better of us again and we got back in the car. Destination numero dos of the day was the iconic Hershey’s Chocolate World. I will admit, it is a little sacrilegious for me, but whenever we traveled to Pennsylvania when I was younger, we’d always stop here and do the factory tour. It was quite nostalgic. Everything was very similar to how I remembered it: the spinning floor (which spins WAY too fast) to get into the carts for the tour to the Hershey mascots explaining the chocolate making process. We ended the day the best way possible with Rakestraw’s Ice Cream. This ice cream shop has been in business since 1903 and was my one of dad’s favorite places as a kid. The 32 flavors are locally made and range from your classic vanilla to teaberry, an iconic Rakestraw’s flavor. The five of us each got a scoop and enjoyed them outside on the parking lot wall, concluding a perfect day. Quality time with Nana and Pop Pop was such a treat since we don’t get to see them too much. 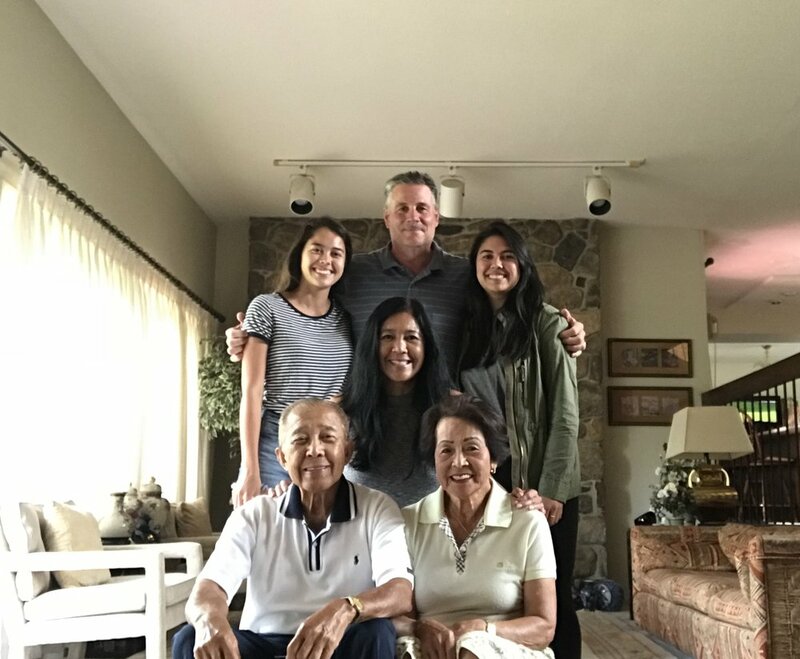 After a lovely morning with them, filled with pictures, and goodbyes, we drove a mere two hours to Lola and Lolo’s to spend the next few days there. We arrived in the late afternoon and were immediatley persuaded into numerous rounds of mahjong. The only interruption to mahjong was dinner, where I basically filled up on Lola’s egg rolls (they’re the best in this world), and we were immediately back at it. Lola and Lolo absolutely destroyed us in ever round. I think between Gina and I we maybe won two of the fifteen (twenty? I’m not really sure) rounds we played in the wee evening hours. 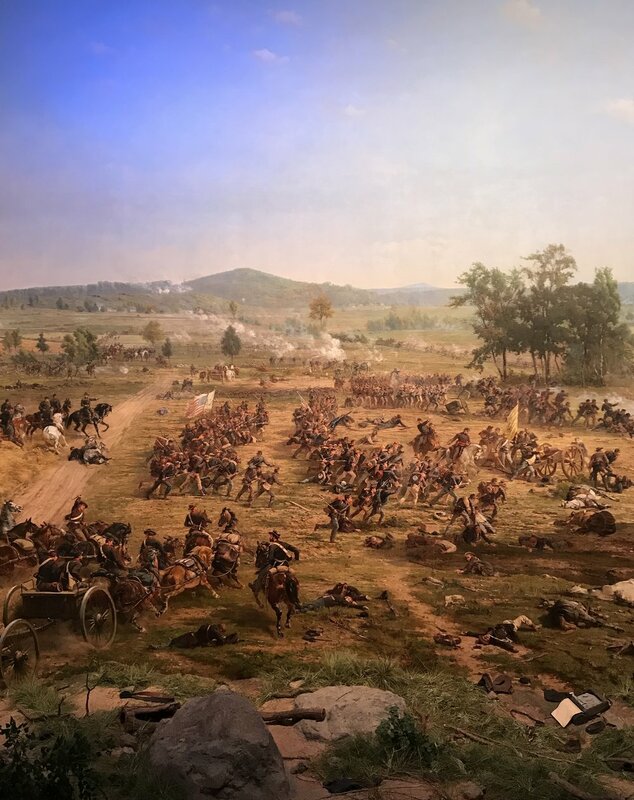 Lola had an ultimatum the next day and that was to check out the cyclorama at the renovated Gettysburg National Military Park. Let me just say, I heard the world cyclorama far too much that day. Anytime I hear it now, it sort of haunts me. CYCLORAMA ISN’T EVEN A COMMON WORLD AND SOMETIMES POPS UP MORE THAN I EXPECT IT TO. Before we when to check out the historical landmark, we had to stop by the sunflower fields someone had told Lola about. 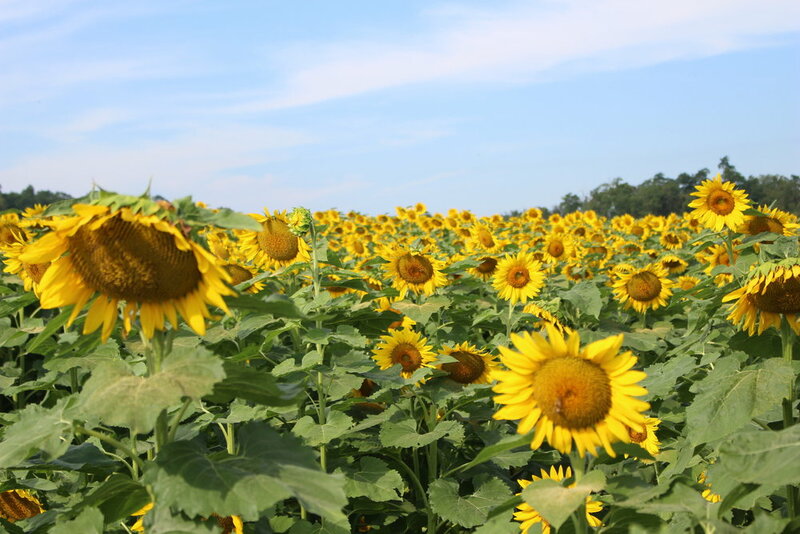 It felt like we were in the middle of nowhere, then as we rounded a corner, there were just rows of yellow. We haven’t explored Gettysburg in years and it was fun to now that I actually knew U.S. history. Now as jaded as I am about this cyclorama, I will admit it was cool. It’s a 360º painting of an American battlefield accompanied by audio to simulate the great Battle of Gettysburg, a turning point in the Revolutionary War. A trip to Gettysburg isn’t complete without touring the battlefield. We embarked on the drive through park, marveling at the monuments dotting the fields. The coolest landmark was the State of Pennsylvania monument, a white pavillion towering over the area. We hopped out of the car to take pictures with Gina and I scurrying up the stairs to get a better view. In one of the columns, I found a spiral staircase to the top of the memorial which offered views of Gettysburg and beyond. On my last day, we mostly relaxed at the house. The morning was spent going through some of my mom’s stuff in her room and watching Lolo catch groundhogs in their backyard. In the afternoon, we caught a movie showing at the local mall (which was desolate…I think there were four open stores) and saw Crazy Rich Asians since I had just finished the book. And yeah, the evenings were spent eating, enjoying time together, and mahjong, lots of mahjong. As at Nana and Pop Pop’s, the next morning was bittersweet with family pictures and goodbyes. My flight was out of Baltimore and we had to leave early for drive and allday travel. But, I’m really happy that I was able to visit both sets of grandparents and appreciate my time back east. Until next time!